A Value Proposition is an internal document used to structure the product capabilities and services you provide that are likely to be of value to your customers to ensure that all messaging communicated internally or externally is consistent. 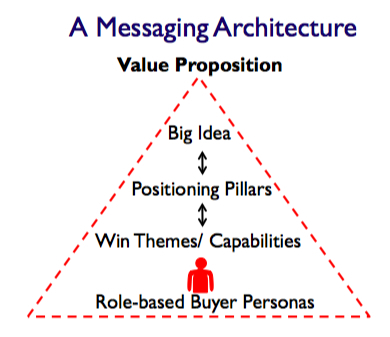 The Value Proposition is the foundation for a Messaging Architecture to ensure consistent brand messaging, website content and sales ready-messaging. Developing your value proposition is a crucial first step in aligning sales and marketing messaging. Do you have a clearly structured value proposition and message or are you merely tweaking what you had before? How many versions of the value proposition are their in circulation? - without structure, probably a multiple of the number of sales and marketing people in the company. Once in place, the value proposition serves as a compass to direct all outbound marketing communication and aligns the sales team around one core set of messages. Senior executive level engagement and commitment is required to round up the right people and dedicate the time to create the Messaging Architecture in a Messaging Workshop.